The Motorola Moto G starts off with the basics - quad-band GSM/GPRS/EDGE and 3G globally, or CDMA support for the North American model. Also on board is Bluetooth 4.0 alongside Wi-Fi support which includes b/g/n. 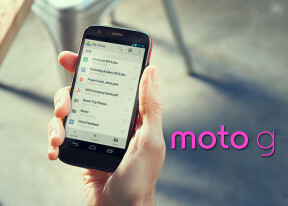 Although it is missing some of the more advanced connectivity features like NFC, and IR-port, or LTE support, the Moto G does have an FM radio and GPS. The Moto G comes with Google Chrome as its solitary preinstalled browser. The interface hasn't changed much since Chrome's launch for Android and is clean and minimalist. At the top there's an URL bar with a refresh/stop button next to the tabs and settings buttons. You can switch between tabs with a wide swipe from either the left or right of the top bar. Opening the tabs area reveals a list of tabs which can each be closed again with a left or right swipe. The animation accompanying this action is neat, too. Of course, one of Chrome's strengths is its ability to seamlessly sync with its desktop version using nothing but your Google account. This allows you to open an article on your PC and finish reading it on your mobile phone. It also syncs your bookmarks and favorite sites. If you are out of Wi-Fi access, you can, for example, choose temporarily not to load images. Digging into Chrome's options, you also have the option to toggle form auto-fill and password storing. Unfortunately, while Chrome excels in many areas, it falls short on the one that could be a deal-breaker for many Android users - Flash. Sadly, as Adobe has dropped support for Android, viewing Flash content is the one thing you won't be able to do here.